Deadly unrest grips Egypt for a fifth straight day. One man killed in Cairo, and another shot dead in outside a police station in Port Said. Deadly unrest gripped Egypt for a fifth straight day on Monday, as the main opposition bloc turned down an invitation to hold talks with President Mohammed Morsi and called instead for fresh mass protests. AFP reported that a man was killed as police and protesters clashed in Cairo and lobbed rocks at each other on a bridge in an underpass leading to the capital's iconic Tahrir Square, as tear gas hung heavily in the air. Late Monday, medics said one person was shot dead outside a police station in Port Said, where dozens of people have been killed in confrontations between demonstrators and police since Saturday. The latest clashes in the capital continued sporadically throughout the day, witnesses said, accusing gunmen of opening fire on the demonstrators from rooftops. "There are many people wounded by gunfire," Ahmad Doma, an activist at the scene, told AFP. He blamed the shootings on Muslim Brotherhood-linked militiamen. A security source said two officers and nine soldiers were also injured in clashes around Tahrir Square, and that protesters torched two personnel carriers. As the unrest showed no signs of abating, Egypt's Islamist-dominated Senate ratified a law that would grant the armed forces powers of arrest, a day after Morsi announced a crackdown. Morsi, who hails from the Muslim Brotherhood, on Sunday declared a month-long state of emergency in Port Said, Suez and Ismailiya provinces where around 50 people were killed and hundreds wounded over the weekend. He also slapped night-time curfews on the three provinces after police stations were attacked following death sentences passed on Saturday against 21 supporters of a Port Said soccer club over stadium violence last year that killed 74 people. Thousands of protesters, however, flooded the streets of Port Said, Suez and Ismailiya after the 9:00 p.m. curfew went into effect in defiance of the measure, witnesses said. Earlier in the day, hundreds of mourners marched in Port Said on a second day of funerals for those killed in the canal city. Hundreds more took to the streets of the Mediterranean city of Alexandria, the official MENA news agency reported. Although most of the bloodshed has focused on Port Said, the violence erupted on Thursday in Cairo on the eve of the second anniversary of the uprising that overthrew Hosni Mubarak, with police and protesters clashing. 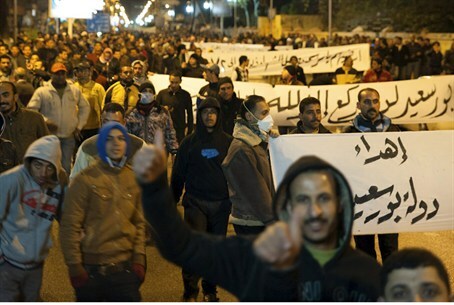 Disgruntled Egyptians say the revolution failed to reach its goals of social justice. Meanwhile, the National Salvation Front, a coalition of mainly liberal and leftist movements, called for countrywide protests on Friday. "We will not participate in dialogue that is empty of content," leading dissident Mohamed ElBaradei told reporters after a meeting of the NSF. The bloc wants the formation of a national salvation government and the amendment of the Islamist-drafted constitution, before it agrees to any talks. An NSF statement called "on the Egyptian people to take to the streets in all Tahrir Squares (across the nation) on Friday to stress the sanctity of the blood of the martyrs and achieve the goals of the revolution." The White House on Monday condemned the unrest and urged Egyptian leaders to make clear violence is never acceptable. "We strongly condemn the recent violence that has taken place in various Egyptian cities. We look to all Egyptians to express themselves peacefully and look to Egyptian leaders to make clear that violence is not acceptable," it said, according to AFP. The State Department said Washington was looking to Morsi's government "to bring to justice those who were responsible for deaths and injuries, whether they were sustained by protesters, whether they were sustained by the police."